GLENDALE – The Armenian National Committee of America – Western Region recently announced that it will be partnering with the Los Angeles County Registrar-Recorder/County Clerk and other Elections officials to organize a series of Community Meetings in Glendale, Pasadena, and the Crescenta Valley to give residents the opportunity to discuss potential Vote Center locations to be placed within their neighborhoods in 2020. 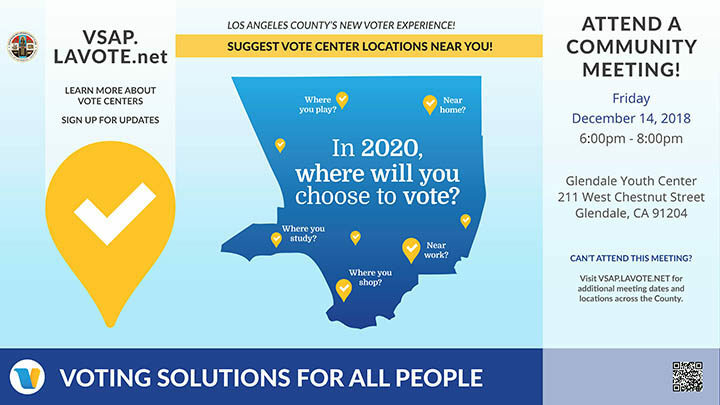 The new vote centers are part of the new voting model set to be launched for the March 2020 Statewide Primary Election. For more information, please email info@ancawr.org or call 818-500-1918.